No two people have the same definition of “Perfectly”. “Perfectly” is not a permanent state. The world changes around ‘Perfectly” and it changes too. Without notice, and often. Literally, what is “Perfect” now may not be “Perfect” in an hour. 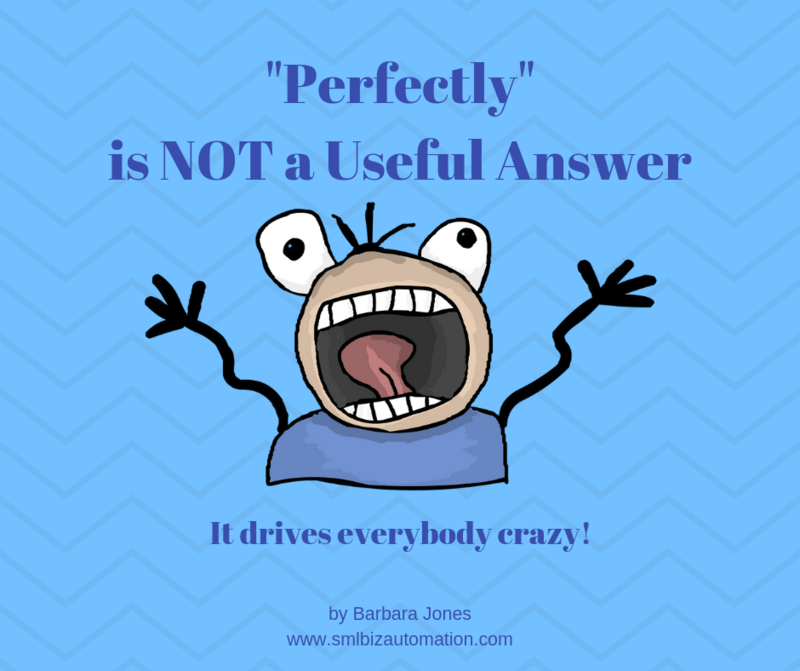 When a business owner uses perfection as a performance measure it is often because they hate having to explain anything. They say people should “already know the answer” or “it should be obvious” to anyone with a brain. I’ll bet you can guess what happens if the staff go ahead and use their own definition of “Perfectly”. You’re right – the business owner is extremely irritated they could be so off-base, so totally wrong. What does “Perfectly” look like – how can it be recognized? Who decides if this task is “Perfectly” done? Tasks in a business don’t need to be done to meet a standard that exists in one person’s mind. Tasks in a business don’t need to be done to meet a standard that exists in one person’s mind. They need to be done to the point of meeting the needs of other interrelated tasks. These other tasks provide useful stopping points. Without them how would anyone ever know when it was appropriate to stop anything? How would anything ever move forward? There are very few work processes in a business that have no natural stopping point. For instance, taking phone messages has a natural stopping point of notifying the appropriate staffer of the content of the message, or of taking the first step in a work process that satisfies the caller’s request. When business owners say a task needs to be done perfectly they often mean “done so no one has to bother me with anything about it and it will never cause me any problems.” When a team or group says this they often mean, “so the brand-new staffer doing this can produce the same result I would without interrupting me so often I might as well do it myself”. Ask about “Successfully” rather than “Perfectly,” “Successfully” is the standard that is realistic and attainable for work processes. Always ask what failure looks like for the task in question. It is much easier to recognize what is seen when things go wrong than when they go right. It is easy, though, to turn a statement about failure into a statement about what the successful result would look like. How success looks, and how it is recognized is essential to establishing common work standards. A business cannot grow if it is stuck in “the boss wants everything done perfectly but nobody knows what that means.” Enormous amounts of time and energy are wasted. Morale is not great. Staff members look for jobs with less frustration. The only solution that produces growth is spending the time to figure out how tasks need to be done to produce the desired results. That information must be written down and tested and edited. This activity loop, repeated as often as needed, is how real and useful information is created and how perfection is defeated. Yes, it is a lot of effort and not always fun. But the alternative is worse. As a work standard, “Perfectly” is truly useless.